Carey Mulligan (right) in Suffragette. In Suffragette, director Sarah Gavron keeps her camera tight on the faces of her cast. For real — a lot of this movie is shot in serious close-up, to the point where people who suffer from personal space issues might start to feel a little uncomfortable. Gavron probably had multiple reasons for making this directorial choice: first of all, with a cast like this (Carey Mulligan, Helena Bonham Carter, Brendan Gleeson, Meryl Streep) you want to watch them work as closely as you can. And second, it's probably much cheaper to shoot a historical drama revolving around the suffragette movement in 1912 London if you keep the camera trained closely on your actors and not on, say, sweeping panoramic shots of busy streets. 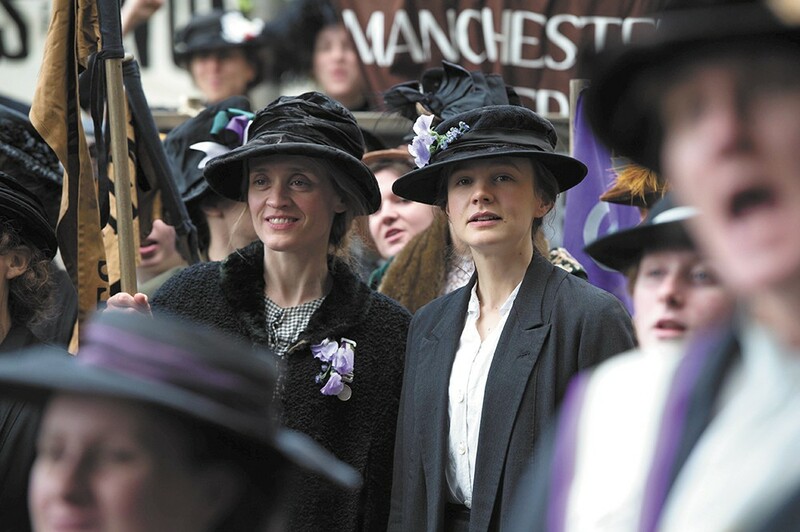 These dueling reasons demonstrate everything that's good and bad about Suffragette. On the one hand, it's built around a handful of stunning performances, but on the other hand it's frustratingly small in scope. It has the heart of a grandiose historical epic, but the wallet of a minor-league Jane Austen adaptation. Mulligan stars as Maud Watts, a Londoner who was born and raised in a laundry. Setting aside the fact that Mulligan's skin, hair and teeth are way too perfect for the role, she does marvelous work holding the film together. Mulligan never fails to put her best work on screen, and in at least three scenes in Suffragette she'll push you into a visceral response — first tears, then sympathy, and finally a sense of triumph. Mulligan is bolstered by a few other strong performances — Gleeson as the detective assigned to dismantle the suffragette movement, Streep in a glorified cameo as Emmeline Pankhurst, the leader of the movement — but she never once cedes the spotlight; this is her journey, and even though she's sharing screen time with some of the biggest talents in the movies today, she carries the film on her back, every step of the way. But Suffragette is haunted by a sense that the definitive film about women's suffrage still has yet to be made. Mulligan's protagonist is a fictional construct, and she swirls around a stew of half-real and half-made-up characters, a decision that gives the film a little less urgency than, say, a biopic about Pankhurst might have earned. As wonderful an actor as Mulligan is, the scenes with her domestic drama — a husband who doesn't understand or appreciate Watts' drive to protest the status quo — at times feel perfunctory. Suffragette is not showing in any theaters in the area.